By the time I got to Kozeg I was obsessed with getting home and could only think about finishing the walk. My pre-occupation with the end of trip inevitably meant that I rushed at things through Hungary and missed some of the local colour. Still I enjoyed I enjoyed the last two weeks, had lots of adventures and came away with some wonderful memories. I knew less about Hungary than any of the countries I had visited. I had been to Budapest a couple of times before, and loved it, but had never left the City boundary and didn't really know what to expect. More than any stage of the trip the last part of the walk felt like a real journey into the unknown. What I found was a revelation. The walking, to be honest, was nice rather than spectacular and the predominant impression left is one of long forest trails with huge deciduous trees - oak, ash and beech - and closed rather than open views. The villages also lacked the ancient stone splendour of their cousins in Spain and France. What I did find, however, was a country that was really easy to walk in. The route was clear and a pleasure to follow, food and accommodation was generally plentiful, good and excellent value, and above all the people were friendly and helpful. I had been "rescued" many times along the E4 but in Hungary the rescues came thick and fast and have left me with a particularly fond memory of all things Hungarian. The E4 in Hungary follows the route of the Countrywide Blue Tour which can claim to the first long distance hiking trail in Europe and is without doubt the most important walk in Hungary. It does takes a incredibly indirect route however and meanders through hilly/rolling countryside all the way to Budapest (doesn't got into the city centre) before continuing (without me!) to Hungary's eastern border. There is an amazing amount of information on the Blue Tour. When researching the route I had found two outstanding sites available in English and both called Countrywide Blue Tour, one maintained by Peter Istvan Papics and the other by Horpolin and Son, and used these to develop my itinerary. I somehow managed to miss the best site however - which I think is a sort of open map initiative - the turistuatak site. This has everything you need to plan a walk through Hungary, downloadable maps, routes, and information on places to stay and eat. Although I hadn't found the amazing turitstuatak site before arriving in Hungary I felt pretty well prepared. In particular I had downloaded a GPS trail for the route and was confident I could find my way. In practice however I hardly needed the GPS because the waymarking, with a white and blue sign every 20 metres or so, was brilliant. Help with accommodation also flooded in via the blog with lists of places to stay and even an occasional booking service. Kind Hungarians would contact me and then ring ahead and make the reservations. What I wasn't prepared for was the "feel" of the Hungarian countryside and to be honest I'm still trying to work out my reaction. In particular the "tools" I had to interpret the countryside, which had worked when I was in France and Spain, didn't seem to apply in Hungary. In particular I struggled with the fact that while the countryside was not particularly wild or remote and - despite the lack of evidence of rural depopulation which was such a strong feature of Spain - it was very empty. The different feel to the countryside made it interesting and I was particularly lucky to be joined for a couple of days by Hungarians who helped to interpret some of what I saw. However I'm still left with more questions than answers which I guess is a good reason to return. Staying in Koszeg is a nice introduction to Hungary. The medieval centre of the town is still intact and is being carefully restored. The weather had picked up as soon as I crossed the border and in Kozeg I was able to enjoy lovely ice-cream and later a meal in the central piazza which acted as a magnet to Hungarians on a Saturday night promenade. I stayed in the Hotel Portre which was on the square and very good. The first day's walk to Szeleste was a long one, 35 kilometres and, after a month of indifferent weather, the heat of Hungary came as a bit of shock. Fortunately the route was sheltered in a sliver of forest in what is otherwise open countryside with huge fields characteristic of Hungary's large scale agriculture. Szeleste is big village and the Castle Hotel was one of the more upmarket places I stayed in in Hungary. A shorter 22 kilometre walk next day to the famous spa town of Sarvar again involving a mix of forest and open walking through a more huge fields. The town is quite big (16,000 population) and it's a long walk to the middle and the lovely Nádasdy Castle. Lots of accommodation but I stayed in a little gasthof very near the castle which was excellent but unfortunately I don't seem to have a record of its name. Another long day through flat countryside with the same mix of open and forest walking with the route visiting a number of typical Hungarian villages (Gerce and Kald) although the heat seemed to be driving everyone indoors. I had my first Hungarian rescue when I man in Hosszupereszteg persuaded a bus driver to take me to the local hotel (the Hotel Patyi) which I was struggling to find. Another big 35 kilometre walk with the first 25 kilometres in trees. The main distraction was a lake near Szajk full of very green water and swimmers. The last 10 kilometres is more open although the stretch into Sumeg takes you along a road which you share with large and fast moving vehicles. Towering above Sumeg is imposing castle dating back to the 13th century and one of a series which form an ancient defensive line across Hungary. Found a little hotel right in the middle of Sumeg which was excellent. Next day was a huge 45 kilometre walk, very hot, still through trees but for the first time hilly. For the only time in Hungary I lost the route just south of the Sumeg and only found it again after a bit of bushwacking. The hilly countryside seemed to usher in a different sort of agriculture with fruit trees and vines becoming pre-eminent. Keszthely is a famous resort on the side of Lake Balaton and a big draw for visitors from across Europe and really I should have stayed there but Budapest and home beckoned. Lots of accommodation but just a bit more expensive. The walk next day was in three parts - a short roadside escape from Keszthely; a long middle section mainly through forest but some open countryside at its end; then a really long roadside walk into Tapolca. The hot weather continued and it was official, I was walking through Hungary in the middle of a heat wave. Stayed at the Hotel Gabriella right next to the pretty mill-pond in the middle of the town, eat outside and was savaged by mosquitoes - a shame because the food was good. As the crow flies it's probably about 10 kilometres to Szentbekkalla but the meandering blue route turns this into 35. This, however, was one of the best days of the Hungarian section of the E4 and although the hot weather made for a hazy light the scenery was wonderful with the gentle rolling countryside, the fruit trees and the vines, providing a feel which reminded me of holidays in Tuscany. Lots to see on this section, great views of Lake Balaton and a chance to visit the castle at Szigliget. I also shared the day with four Hungarians who, bit by bit, were walking the whole of the blue route. Stayed at a lovely guest house which had been booked for me by a blog commentator. From Szentbekkalla, and after three days of meandering, the route turns decisively east. The next day was a really pleasant 20 kilometre walk with good views back to Lake Balaton, helped by the fact the extreme heat had gone and the haze with it. Nagyvazsony is a pretty village with Kinizsi Castle at its heart. I stayed at a simple but very adequate guest house near the castle. Apart from the bit in the middle, around Varoslokislod, next day's walk was excellent, although at 42 kilometres quite a long one. Rolling countryside, mainly through forest, but with the occasional open stretch, it was helped by perfect weather, warm rather than hot and very clear. Bakonybel is a pretty little town and I stayed at another pleasant guest house. The next days walk was a nice short one to Zirc, only 18 kilometres, so plenty of time to rest up. A good walk which included the gentle climb up to Koris-Hegy which at 709 metres is, I think, the highest point on the E4 in Hungary. 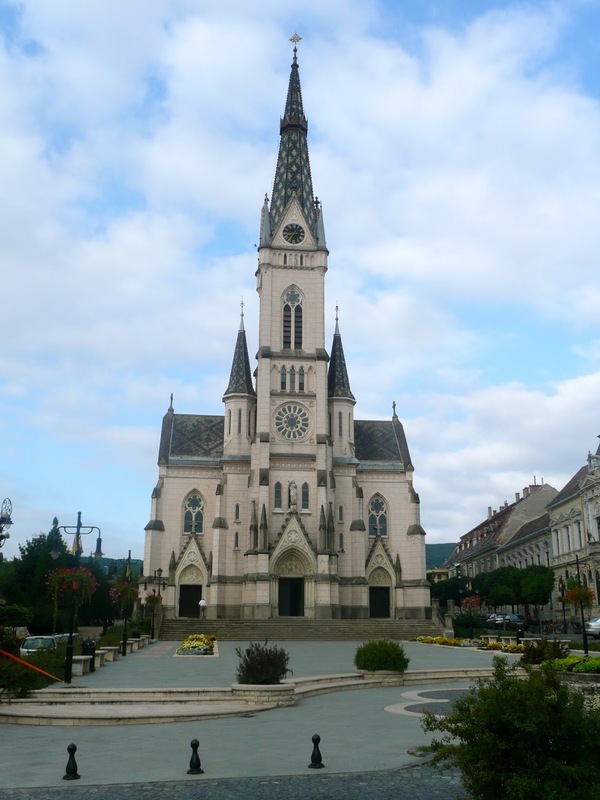 Zirc is a pretty town centred around a spectacular baroque Cistercian abbey. Stayed at the Jesko guesthouse, excellent value but unfortunately, when I was there, no food. Next day's walk was huge, 50 kilometres to Fehervarcsurgo but was rewarded at the end with some splendid accommodation in a castle. The route visits a series of fairly substantial villages, Bakonynana (the southern edge), Jasd, Tes, Bakonykuti, and a variety of landscapes. The dense woodland opens up completely towards the end into open heath before closing up again as it drops down to the lake at Fehervarcsurgo. Stayed at the Karolyi Kastely which was absolutely splendid. Another circa 50 kilometre walk next day and a walk with three distinct parts. A pleasant starter, around the lake and along a very pretty gorge; a rather plain main course, across a wide open valley with a lot of road walking, and a splendid dessert meandering through a forested national park before arriving late at the village of Vargesztes. The hotel I was hoping to stay in was shut but some locals in a bar found me some accommodation and I had a really pleasant evening sharing a meal with them. It was a lovely morning next day, a little bit of a mist which created some amazing sunbeams through the trees. The mist cleared however and by the middle of the day and the trip across the valley and through Szárliget it was hot. Stayed at Tatabanya, a Hungarian new town of the route, the only place I could find accommodation, which, like new towns in the UK, is not necessarily a place you would choose to visit. The Blue Route is definitely not a straight one, having visted Lake Balaton twice the route takes another detour north into the Danube valley before finally heading east to Budapest. Next day, a 28 kilometre walk, took me close to but not to the top of the Gerecse valley and then down along a pretty trail to Mogyorosbanya where I stayed at the very pleasant Club Leonardo. A good walk which was getting busier as I got closer to Budapest. Penultimate day of walk and a very nice one too. For once I was not walking in trees and, often from ridges, was able to enjoy views north to Slovakia and the Danube, and west back to the Gerecse mountain. The only "obstacle" was the old industrial town of Dorog but the walk after the town to Piliscsaba was particularly good. I then experienced another and perhaps the best example of Hungarian hospitality. 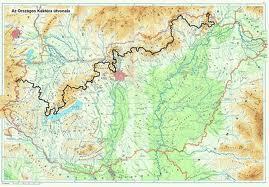 I had been advised that there was no accommodation in Piliscev so planned to stay Klastrompuszta. Unfortunately the guesthouse was full. The landlady tried to contact an address in Piliscev but with no luck. She gave me the name of the place and after getting to the village, wandering around aimlessly for a bit, a man in a bar gave me some instructions. When I found the place, the Kelemen Majorsag which was right on the eastern edge of the village, it was a goat farm (although it had virtually every farm animal other than cows) whose accommodation is still in the process of completion. They were expecting me however, the landlady from Klastrompuszta had made contact, and I got really well looked after. They not only fed me with wonderful local produce but found me some accommodation. No-one would take any money - really nice people and very kind. For the walk into Budapest I was joined by Csaba Almási, ex-Hungarian Long Jump champion and a really nice guy. To be honest I can't remember much about the walk itself. We stopped for lunch at the home of one of Csaba's relatives, had some beer, crossed the City boundary, drank some Hungarian champagne and some more beer, caught tram into the City centre and of course had some more beer. I was interviewed by the media man from Hungarian Olympic Committee and, after all those beers, provided a very cogent explanation why I did the walk and what I found out about myself - it was sensibly dubbed so unless your Hungarian the mystery remains intact. I wish you many wonderful experiences at other hiking. Perhaps it goes even further on the E4? Also still to come to Budapest wonderful landscapes! Well, if you wish to come back to Hungary, you can go with me next summer (August 2015) ! Thanks for the invite Oliver, very kind, unfortunately I'm already booked up this year with various trips. Have a great time in Hungary, I have fond memories of my time there.